Can acupressure relieve your allergies? According to the author of Acupressure's Potent Points, allergies cannot be cured by acupressure but can have their symptoms successfully treated and reduced by it. Allergies are a reaction of the body to certain substances that come into contact with it, either through your breathing, your nose, your eyes, or even your skin (such as the case of poison ivy and similar plants). According to the creator of EFT, all negative health symptoms, including allergic reactions, are correlated to a disruption in the body's energy meridian system. Therefore, a system of energetic healing like acupressure is well suited for relieving negative health symptoms such as those caused by allergies. The following acupressure points do not target every possible allergy symptom of every possible allergy. That would be impractical to show every possible combination of acupressure points. Instead, they provide a general treatment for any allergic reaction. The purpose of these points is to sooth your body and reduce the intensity of its allergic reactions in general. If you suffer from allergies for just a day, then use these points once or twice to reduce your symptoms. However, if you suffer from chronic allergies that last weeks or months, then you should use these points at least three times a day for as long as your allergies last, in order to maximize allergy relief. Let's take a look at our anti-allergy acupressure points below. 1. Large Intestine 4 - Between the bones of the thumb and index finger. Warning: This point should not be used by pregnant women unless they are already in labor. This point may cause premature contractions of the uterus. Use this easily accessibly hand acupressure point to relieve all kinds of allergies. This pressure point will be effective at treating just about everything, including headaches, sneezing, hay fever, and itching. Since it's located on an easy to use spot on your hand, this point is ideal for using acupressure discretely while out in public. 2. Liver 3 - Between the bones of the big toe and second toe. This acupressure point also relieves all sorts of allergic reactions. It is especially effective at treating bloodshot eyes. This meridian point is also useful for treating neuromuscular disorders. 3. Triple Energizer 5 - On the outside of the forearm, in between the forearm bones, two thumb widths down from the wrist joint. Use this meridian pressure point to strengthen and balance your immune system in general, which can help relieve many types of allergy symptoms. 4. Large Intestine 11 - On the outer edge of the elbow crease. 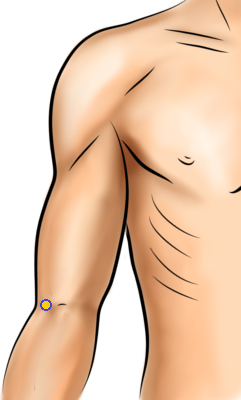 This is another easy to access acupressure point for allergies on your arm. This point is good to use discretely for allergy relief while in public. 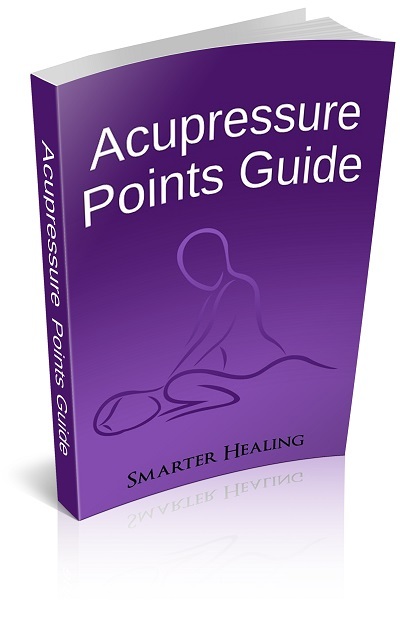 This Large Intestine acupressure point will relieve allergic reactions in general. It is especially effective at treating symptoms related to the skin, such as hives, rashes, and itching. This acupressure point is also especially effective at treating fevers. 5. Bladder 10 - Half an inch below the base of the skull, slightly to the side of the spine. 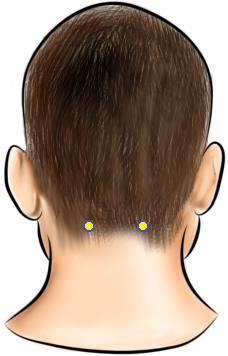 This pressure point on the back of your head will relieve allergic reactions related to the wellbeing of the head. These reactions include general exhaustion (mental fatigue), headaches, and swollen, irritated eyes. 6. Kidney 27 - On the bottom side of the collarbone, two thumb widths to the side of the center of the chest. Use this acupressure point on your chest to relieve allergic reactions related to the chest, such as breathing difficulties. This pressure point will help reduce symptoms such as chest congestion, asthma, coughing, and sore throats. 7. Conception Vessel 6 - Exactly 1.5 thumb widths below the belly button. This Conception Vessel meridian point will relieve symptoms of allergies and other disorders that are related to the lower abdomen. You can use it to get rid of constipation and gas. It will also relieve fatigue (related to the metabolism of the body), and general weakness. This point is also effective at relieving insomnia. 8. Stomach 36 - Found 3 thumb widths below the knee cap, one finger width towards the small toe side of the leg. Use this acupressure point on your lower leg to strengthen the entire body in general. This will help with relief from all allergy symptoms.